Democracy has solid majority support in Peru yet still lags behind most other Latin American countries, according to a survey by the Latin American Public Opinion Project released in Lima, Peru. 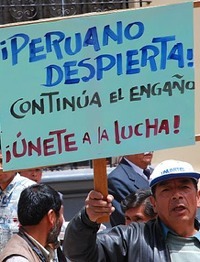 But there is widespread dissatisfaction with the country’s political system and general skepticism about how the government protects Peruvians' rights, according to the report LAPOP issued in cooperation with the Instituto de Estudios Peruanos, a Lima-based, independent, non-profit organization devoted to social science research. “The challenge is to increase the quality of democracy, making institutions more effectively responsive to the requests of the population, hence reducing popular dissatisfaction,” concluded the report by Julio Carrión and Patricia Zárate titled Cultura Política de la Democracia en Perú: 2006. The results were released Monday at the Instituto de Estudios Peruanos to officials in the executive office of the Peruvian government. The poll was carried out in June 2006 among 1,500 people in Peru shortly after Alan García was elected president. This study is part of a series of surveys by LAPOP's AmericasBarometer, an effort to measure democratic values and behaviors in the Americas using national probability samples of voting-age adults. The surveys are made possible with funding from the United States Agency for International Development and the Center for the Americas at Vanderbilt University. The series covers 19 countries in Latin America, the Caribbean and North America, and is directed by Mitchell A. Seligson, Centennial Professor of Political Science at Vanderbilt University. Dissatisfaction with the political system in Peru is balanced by relatively high levels of political tolerance toward minorities, the survey shows. The best scenario for a stable democracy includes both support for the system and political tolerance, said Carrión, LAPOP regional coordinator for Mexico, America Central and South America, and Zárate, a researcher at the Instituto de Estudios Peruanos. “In Peru, only 1 out of 5 people are in that place. …This number is among the lowest found in Latin America in 2006,” Carrión and Zárate say in the report. Fragile citizen support of the political system manifests itself in the low levels of confidence in institutions linked to the administration of justice and to political representation. These levels of confidence are among the lowest in the region. Relatedly, the perception of corruption of public officials is among the highest in the region. The poll found that approximately 30 percent of those interviewed claim to have been victims of at least one act of corruption, whether in the private or the political sphere. This percentage is significantly higher than the numbers registered in Chile (9.4 percent), Colombia (9.7 percent) and Panama (11.3 percent). The report states that citizens more affected by corruption are more willing to tolerate it, thus creating a vicious cycle. High crime levels also present a significant challenge. Peru is the country with the highest rate of victimization through crime in the entire region, according to the report. More than 25 percent of the people asked stated that they had been victims of a criminal act. Of these, almost 40 percent had been victims of violence. As the study discovered, in Peru crime affects everyone without regard for social or economic status. While the report noted high levels of citizen involvement in local government, such activism does not seem to translate into higher levels of confidence in the system, in part because the majority of Peruvians (almost 60 percent) feels that they have no influence in political matters. Finally, high citizen participation in strikes and public protests is consistent with the finding that most Peruvians have only a scant level of support for and confidence in their political system. The publication and data are free to the public and can be obtained at the following link: www.lapopsurveys.org. LAPOP, a project group in the Center for the Americas at Vanderbilt University, was founded in the 1970s by Seligson to conduct scientific surveys of Latin American citizens about their opinions and behaviors related to building and strengthening democracies. Its new AmericasBarometer now covers nearly the entire Western Hemisphere.